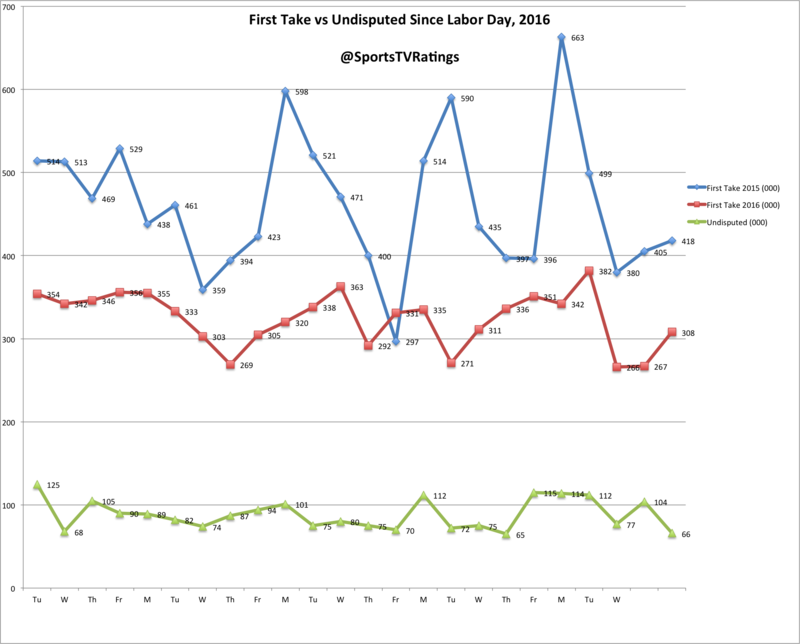 Another update to the original post that includes data through Friday, October 7, 2016. ← Are Skip Bayless and Colin Cowherd worth the money? I really want Undisputed to win this battle eventually. It is a far better show! I don’t look at this as apples vs apples. The average sports person just doesn’t go to FS1 or NBCSN as it’s go to sportschannel, yet. If you put Speak for Yourself, Garbage Time, Undisputed on ESPN, the ratings would be much better. Yeah because ESPN is an institution and as long as it’s around it will remain the king. Skip Bayless didn’t make First Take popular, ESPN did. He’ll never be as popular unless he goes back to ESPN. Hoping FS1 takes over ESPN would be like hoping Arena league becomes more popular than the NFL. If there’s two of the same things the more popular will always win.